Interesting article at MarketWatch.com about Quantitative Easing II and Ben Bernanke defending the Fed's decision to purchase $600B in securities (click here). What does this mean in English? Basically, the Federal Open Market Committee decided to put more money into our economy by printing more money - this causes money to be cheaper and hopefully increase the flow of credit and investments - which are intended to help "spur" the economy along. This makes the value of the dollar worth a little less than what it was worth yesterday...so your cash savings in your bank account, that's earning maybe 1%, is worth even less today. So with that being the case, the average consumer decides it's more beneficial to invest than it is to save...so more money pours into the stock market (essentially giving money to corporations and small businesses so that they may grow, expand, and hire more people). An influx of jobs would be great for the economy - but with the government debasing the dollar's value, things will inevitably become more expensive (i.e., commodities such as food, oil, gas, etc....which further supports my last few articles for you to invest into commodities if you haven't already!). 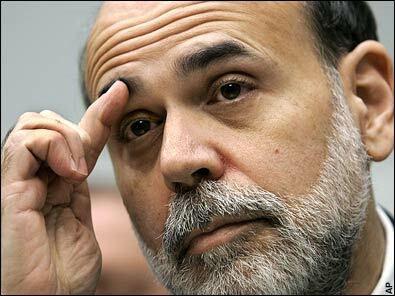 Hate him or love him, Bernanke is concerned about the economy and the high unemployment, and he's also concerned about the near unsustainable deficits carried by the US....as he mentions in the article - the Fed alone cannot save the economy. It will be a combination of several other factors working together to get America thriving again.